“…I [Nephi] saw among the nations of the Gentiles the formation of a great church. And the angel said unto me: Behold the formation of a church which is most abominable above all other churches, which slayeth the saints of God, yea, and tortureth them and bindeth them down, and yoketh them with a yoke of iron, and bringeth them down into captivity… I beheld this great and abominable church; and I saw the devil that he was the founder of it.” (1 Nephi 13:4-6) Nephi saw the formation of an evil church, whose founder was the devil. In this church there was gold, silver, silks, scarlets and fine-twined lined and all manner of precious clothing. Nephi sees that many of the seed of his brethren were divided among the waters and a multitude of them forming in the promised land [America], where they; “…had gone out of captivity were delivered by the power of God out of the hands of all other nations… I, Nephi, beheld that they did prosper in the land; and I beheld a book, and it was carried forth among them.” (1 Nephi 13:19-20) Nephi had seen the colonizing of America and the scattering of the Gentiles! Nephi also beheld a book that was carried with them into the Promised Land; the Angel asked him if he knew that this book was, and Nephi responded that he did not. The Angel explains; “…Behold it proceedeth out of the mouth of a Jew… a record of the Jews, which contains the covenants of the Lord, which he hath made unto the house of Israel; and it also containeth many of the prophecies of the holy prophets; and it is a record like unto the engravings which are upon the plates of brass, save there are not so many; nevertheless, they contain the covenants of the Lord, which he hath made unto the house of Israel; wherefore, they are of great worth unto the Gentiles.” (1 Nephi 13:23) This book that is being referred is the Bible, more specifically the Old Testament of the Bible which was written in part by the Jews. The Angel explains to Nephi that at the time this Book “…contained the fulness of the gospel of the Lord, of whom the twelve apostles bear record…” (1 Nephi 13:24) However, the Bible was continued with the New Testament which included more of God’s word and at the time of its completion was also considered the ‘fulness of the Gospel’. In this sense the Book of Mormon only adds to the value of the Old and New Testaments the same was the New Testament adds value to the Old Testament. Many wonderful men tried to bring those lost gospel truths to the light of the people, however with so many truths lost, many argued over who was right and as a result we see the formation of many churches throughout the world. It is also no wonder that this ‘great and abominable church’ was that of the Catholic Church. William Tyndale, a man who desired to have the scriptures in the hand of the common man, had an argument with a ‘learned’ clergy man, who said; “We had better be without God’s laws than the Pope’s.” Tyndale responded: “I defy the Pope, and all his laws; and if God spares my life, ere many years, I will cause the boy that driveth the plow to know more of the Scriptures than thou dost! “…I [God] will be merciful unto the Gentiles in that day, insomuch that I will bring forth unto them, in mine own power, much of my gospel, which shall be plain and precious….” (1 Nephi 13:34) The Lord will command prophets in the Americas to write his Gospel, that it might not be perverted from the writings of the Bible in the ‘Old World’. Because of this, the Lord will curse the land with great heat and the land shall become barren. The people of Canaan were also cursed with a blackness and were despised among all people. The Lord commanded Enoch that he should preach unto those people repentance, that they might become baptized and receive the Holy Ghost. Enoch preached mightily throughout the land, so much that when; “…he spake the word of the Lord… the earth trembled, and the mountains fled, even according to his command; …the rivers of water were turned out of their course; and the roar of the lions was heard out of the wilderness; and all nations feared greatly, so powerful was the word of Enoch, and so great was the power of the language which God had given him.” (Moses 7:13) Enoch was a true prophet, which had been called of God. God gave Enoch the power and Authority to do these things in the name of the Lord. Even though there were many wars throughout the land, the people still feared the Lord. Those who truly feared the Lord were called the people of Zion; “…because they were of one heart and one mind, and dwelt in righteousness; and there was no poor among them… Enoch continued his preaching in righteousness unto the people of God. And it came to pass in his days, that he built a city that was called the City of Holiness, even Zion.” (Moses 7:18-19) Enoch exclaimed to the Lord that the city of Zion should dwell in safety forever! The Lord explained to Enoch that the inhabitants of Zion he has blessed, but the rest of the people he had cursed. “…the Lord showed unto Enoch all the inhabitants of the earth; and he beheld… Zion, in process of time, was taken up into heaven… Enoch also beheld the residue of the people which were the sons of Adam; and they were a mixture of all the seed of Adam save it was the seed of Cain, for the seed of Cain were black, and had not place among them. And after that Zion was taken up into heaven…” (Moses 7:21-23) Because of the righteousness of Enoch and his people, they and the entire city in which they dwelt were lifted up into the heavens to be with God and His Son. “…How is it that thou canst weep, seeing thou art holy, and from all eternity to all eternity?” (Moses 7:29) and the Lord responds to Enoch; “…Behold these thy brethren; they are the workmanship of mine own hands, and I gave unto them their knowledge, in the day I created them; and in the Garden of Eden, gave I unto man his agency; And unto thy brethren have I said, and also given commandment, that they should love one another, and that they should choose me, their Father; but behold, they are without affection, and they hate their own blood; …But behold, their sins shall be upon the heads of their fathers; Satan shall be their father, and misery shall be their doom; and the whole heavens shall weep over them, even all the workmanship of mine hands; wherefore should not the heavens weep, seeing these shall suffer?” (Moses 7:32-37) God made it clear; He created the Heaven and the Earth. He created man and gave men knowledge and agency. Satan tempted his children and made them hate their own Father and their own blood. Because of this, God weeps because He is sad to see His children fail. Enoch saw the day of the coming of the; “…Son of Man, even in the flesh; and his soul rejoiced, saying: The Righteous is lifted up, and the Lamb is slain from the foundation of the world; and through faith I am in the bosom of my father…” (Moses 7:47) Here we learn that Jesus Christ was ordained before the Foundation of the World to become the Savior, who would Atone for the sins of ALL mankind! “…Enoch cried unto the Lord, saying: When the Son of Man cometh in the flesh, shall the earth rest? I pray thee, show me these things… The Lord said unto Enoch: Look, and he looked and beheld the Son of Man lifted up on the cross, after the manner of men; And he heard a loud voice; and the heavens were veiled; and all the creations of God mourned; and the earth groaned; and the rocks were rent; and the saints arose, and were crowned at the right hand of the Son of Man, with crowns of glory; And as many of the spirits as were in prison came forth, and stood on the right hand of God; and the remainder were reserved in chains of darkness until the judgment of the great day.” (Moses 7:54-57) Enoch was told about the crucifixion of Jesus Christ, and we learn that when Jesus Christ died on the cross that the Saints arose from the grave. Those who were in Spirit Prison (like Purgatory) that chose to be on the right hand of God were permitted to pass into Spirit Paradise and those who did not would wait in darkness until the Judgment Day. When Shall the Earth Rest? “…the Lord said unto Enoch: As I live, even so will I come in the last days, in the days of wickedness and vengeance, to fulfil the oath which I have made unto you concerning the children of Noah; And the day shall come that the earth shall rest, but before that day the heavens shall be darkened, and a veil of darkness shall cover the earth; and the heavens shall shake, and also the earth; and great tribulations shall be among the children of men, but my people will I preserve; And righteousness will I send down out of heaven; and truth [The Book of Mormon] will I send forth out of the earth, to bear testimony of mine Only Begotten; his resurrection from the dead; yea, and also the resurrection of all men; and righteousness and truth will I cause to sweep the earth as with a flood, to gather out mine elect from the four quarters of the earth, unto a place which I shall prepare, an Holy City, that my people may gird up their loins, and be looking forth for the time of my coming; for there shall be my tabernacle, and it shall be called Zion, a New Jerusalem.” (Moses 7:60-62) God answers Enoch and tells him that YES, the EARTH SHALL REST. However, before the world will come to its rest; great darkness and tribulation must precede this rest. Jesus explains to Enoch that the Book of Mormon will come forth from the earth and that heavenly messengers will come down before the End, to help declare the word of God. In the first resurrection, all men that are righteous [the ‘elect’ of God] will be gathered from the four corners of the earth and he shall prepare a city for them, the New Jerusalem. There, Enoch and his people will also meet at the New Jerusalem and shall; “…fall upon their necks, and they shall fall upon our necks, and we will kiss each other; And there shall be mine abode, and it shall be Zion, which shall come forth out of all the creations which I have made; and for the space of a thousand years the earth shall rest.” (Moses 7:63-64) Shortly after the Second Coming of Jesus Christ the elect will be gathered, the New Jerusalem and Zion shall be established and there shall be one thousand years of peace. “…the Lord showed Enoch all things, even unto the end of the world; and he saw the day of the righteous, the hour of their redemption, and received a fulness of joy’ …all the days of Zion, in the days of Enoch, were three hundred and sixty-five years…. Enoch and all his people walked with God, and he dwelt in the midst of Zion; and it came to pass that Zion was not, for God received it up into his own bosom; and from thence went forth the saying, Zion is Fled.” (Moses 7:67-69) Enoch and his people were taken up to the bosom of the Lord. Zion is Fled… but will return in the Second Coming of Jesus Christ. John explains that he sees the 144,000 who were; “…redeemed from the earth.” (Revelation 14:3) He also sees an; “…angel fly in the midst of heaven, having the everlasting gospel to preach unto them that dwell on the earth, and to every nation, and kindred, and tongue and people. Saying with a loud voice, Fear God, and give glory to him; for the hour of his judgment is come…” (Revelation 14:6-7) John says that this angel was followed by another angel who announced the destruction of Babylon because of their wine and fornication. As members of the Church of Jesus Christ of Latter-Day Saints, we believe that this Angel, who brought forth the ‘everlasting gospel’ was Moroni, who first appeared to Joseph Smith to guide him in restoring the Church of Jesus Christ, that had been lost with time. John explains that we need to “…Thrust in thy sickle, and reap: for the time is come for thee to reap: for the harvest of the earth is ripe.” (Revelation 14:15) Essentially John is saying that it is time to move missionary work forward, because the harvest of men is ripe. James, as a servant of the Lord Jesus Christ writes a letter of wisdom. While the letter is not addressed to any specific people or person, it serves as New Testament literature and as a letter written to all. James explains that we should be filled with joy when we fall into temptation, knowing; “…that the trying of your faith worketh patience.” (James 1:3) In other words, when we are tempted and overcome those temptations we will be made stronger for having been through the temptation. Paul urges us all to ask God when we are in doubt; “If any of you lack wisdom, let him ask of God, that giveth to all men liberally, and upbraideth not; and it shall be given him. But let him ask in faith, nothing wavering. For he that wavereth is like a wave of the sea driven with the wind and tossed.” (James 1:5-6) In this life we will pass through trials and tribulations, we may have doubts and we may not understand everything in this world. But we can ask God, and those who ask God with faith will be given the answers to their righteous desires. Joseph Smith, like many today may ask themselves, which of all the sects is the correct one? Why would there be different beliefs, if there be one God? Joseph Smith was confused and unsure of which religion was right. So he consulted the Bible, God’s word! He read in James 1:5-6; which says that anyone who lacks wisdom will be given it. So, who better to ask which religion was right… then GOD HIMSELF!?! “ After I had retired to the place where I had previously designed to go, having looked around me, and finding myself alone, I kneeled down and began to offer up the desires of my heart to God. I had scarcely done so, when immediately I was seized upon by some power which entirely overcame me, and had such an astonishing influence over me as to bind my tongue so that I could not speak. Thick darkness gathered around me, and it seemed to me for a time as if I were doomed to sudden destruction. It no sooner appeared than I found myself delivered from the enemy which held me bound. When the light rested upon me I saw two Personages, whose brightness and glory defy all description,standing above me in the air. One of them spake unto me, calling me by name and said, pointing to the other—This is My BelovedSon. Hear Him! 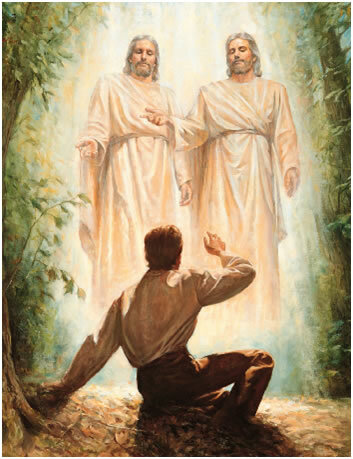 Joseph Smith followed the advice given by James and asked God; which of all the sects was right. Joseph Smith was answered and told that none of the sects were right. This single question from a young, 14 year old boy would lead to God restoring His Church on the Earth, using Joseph Smith as an instrument in His hands. James encourages people to be DOERS and not just HEARERS; “For if any be a hearer of the word, and not a doer, he is like unto a man beholding his natural face in a glass.” (James 1:23) James explains that anyone who seems to be religious but does not follow his religion; “…deceiveth his own heart… this man’s religion is in vain.” (James 1:26) James goes on to explain that pure religion is; “…undefiled before God and the Father is this, To visit the fatherless and widows in their affliction, and to keep himself unspotted from the world.” (James 1:27) While many may claim to be religious, anyone who fails to take care of those around them and stay clean and worthy are not following the will of God.